Horse Zodiac by Clifton Karhu. From The Twelve Animals of the Zodiac series. Dated 1972. Pencil signed and numbered by the artist. Limited edition 44 of 50. 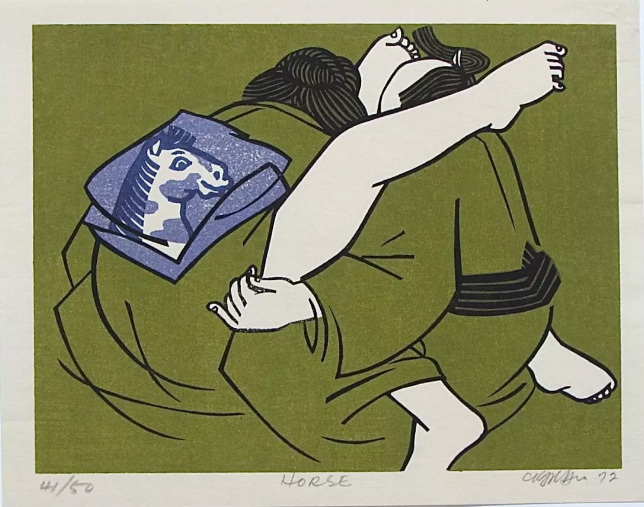 Born in Minnesota in 1927, Clifton Karhu was one of the most celebrated woodblock print makers of the modern era. 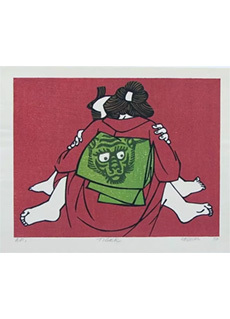 He didn’t find himself interested in the style of woodblock printmaking until around 1963 when he was introduced to them in an old residence of the Japanese Emperor. Stationed at a Navy base located in Japan, he began collecting woodblock prints and soon found himself creating this artwork which made him well known. He has a unique approach and style which is truly identifiable when appreciating his work and is one of the few Western artists who really broke through and was recognized as a master in the style of Japanese woodblock prints.